I love it when a plan comes together; especially when I did not know I had one. Perhaps you have encountered a stranger who turned into a great new friend. Maybe during a casual conversation you learned about a new career opportunity. How about those times that fate just seemed to fall in your lap when you were not even looking? The other Sunday at Redeemer’s Way Foursquare Church, where my wife and I pastor, we experienced a great culmination of such an event. Several weeks ago I got an email via Facebook from a friend of our church. Beth delivers bread for a major bakery. The bakery is coming out with a new bread and they wanted to give out free loaves for a marketing promotion. Beth immediately thought about the past outreaches we have done for the families that live in the apartments behind the church. So she put us down for 50 loaves. Several weeks passed and the bread had not arrived. Beth was persistent though and kept hounding her boss until she got the bread as promised. 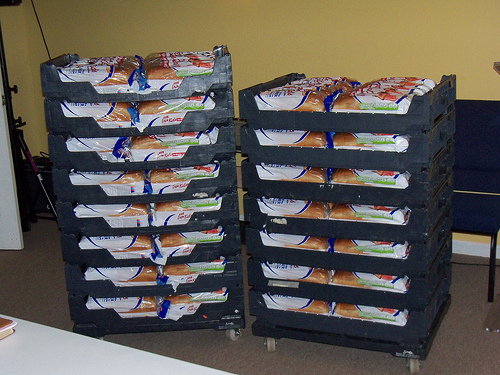 Two other people that were supposed to get bread from Beth backed out, so we wound up with 150 loaves. We took a moment to pray over the bread and ended our service early so we could hand out the bread to the families. Yes it would temporarily fill the stomachs of someone in need, but I knew this was an opportunity for something greater. The bread would give us an excuse to knock on their door. We would then followup by asking how we could pray for them. Our hope was that the bread would be an opportunity to start the conversation to introduce someone to Jesus. I wanted to make sure everyone passing out the bread was expecting the Holy Spirit to accomplish much more than we could on our own. It would prove to be something greater than just handing out loaves of bread. We quickly spread out in the complex handing out the bread and taking prayer requests. Of course some were receptive to us praying for them and others were not. Sue, Julie and Kristen knocked on the next door. The lady who lived there quickly invited them inside. Sue inquired how they could pray for, then plainly asked if she knew Jesus. In just a few moments the three ladies were praying for this stranger and she asked Jesus into her life. What started as a loaf of bread turned into a life changing event. Jesus still uses bread to change lives! This is a wonderful event, and it is great to see how the circumstances fell into place for this lady to experience salvation. Beth was the one who opened the door and started the events that would fall into place to transform someone’s life. Had Beth not been persistent we would have not had a reason to visit that neighborhood on that Sunday. What seemed like a small request for free bread turned into something wonderful. Beth played as much a part for that lady’s salvation as the three that prayed with her. And of course it was really Jesus who made it all happen. We just showed up and gave him yet another bread opportunity. I know I should not be, but I am always amazed at how God puts circumstances and people together for His purposes. 1. What would have happened had Beth not pursued getting Redeemer’s Way the bread? 2. What events has God put together to do something great in your life? 3. How do you try to see beyond the ordinary for something grand?